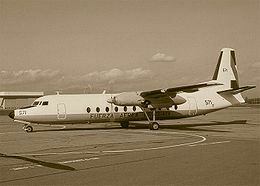 On 9th August 1970 a LANSA flight 502 was bound from Cusco to Lima, carrying 8 crew and 92 passengers. Over half of the passengers belonged to a single group, sponsored by the Buffalo, New York based International Fellowship student exchange program, consisting of 49 American high school exchange students, along with their teachers, family members, and guides. At about 2:55 pm, the plane began its takeoff, at some point during the takeoff run or initial climb, the number three engine failed and caught fire. The crew continued the takeoff and climb, per standard procedure, using power from the remaining three engines. The plane entered a 30–45 degree bank, then rapidly lost altitude and crashed into hilly terrain. All but one of the occupants died from injuries sustained from impact forces and post crash fire. Two people on the ground were also killed. Juan Loo, the copilot, was found in the wreckage of the cockpit badly burned but alive. On 12th May 2010 Afriqiyah Airways flight 771 en route from Johannesburg South Africa to Tripoli, Libya. During the final approach and up to the moment of the accident the pilot had not reported any problems to the control tower. The aircraft crashed about 900 metres (980 yd) short of Runway 09 and came to rest within the perimeter of the airfield. There were 93 passengers and 11 crew members onboard. The Libyan Transport Minister Mohamed Zidan reported that the sole survivor was a boy travelling on a Dutch passport, who was found in the debris. He was later identified as 9-year-old Ruben van Assouw, a resident of the city of Tilburg who was returning from a safari with his family. His parents and brother were also on the plane. On 22nd July 1973 PAN AM flight 816 was en route from Auckland, New Zealand, to Los Angeles, United States, via Tahiti, French Polynesia. The Boeing 707 took off from Faa’a International Airport in Papeete. When the aircraft had reached an altitude of 300 ft (91 m), it began to descend, banking to the left. The increasingly excessive bank caused the 707 to crash into the sea and sink. Neil Campbell, the lone survivor, was a Canadian citizen. At the time he said he had no memory of the actual crash, but “woke up” in the water. Many private vessels from Papeete harbor searched that night with more joining at first light to aid in the search for survivors. The bodies of several of the flight attendants were the only ones recovered. On 8th December 1987 a Peruvian football club Alianza Lima was returning from a Peruvian league match in Pucallpa. They had chartered a Peruvian Navy Fokker F27-400M and on board were 44 people including players, cheerleader and crew members. Uncomfortable with the malfunctioning indicator on his control panel, the pilot requested a flyby of the control tower at Lima’s Jorge Chávez International Airport so that spotters on the ground could confirm that the plane’s landing gear was down and locked. Upon receiving visual confirmation of safe configuration for landing, the plane went around for another attempt at a landing. The Fokker flew too low to the water, and the right wing struck the surface of the ocean as the plane was lining up with the runway and the plane plunged into the water. The only person to survive was the pilot. The crash was ruled as pilot error. On 20th November 1949 an Air Holland plane crashed in Hurum southwest of Oslo, Norway as it was approaching Fornebu Airport. Among the 30 passengers on board were 26 Jewish children from Tunisia on their way to Norway, as an intermediary stop before making aliyah, the return to Israel. The plane crashed into the forest at 16:56, and 34 of the 35 people on board perished. A 12-year old boy named Isaac Allal was the only survivor. On 21st January 1985 a Galaxy Airlines Flight 203 took off from Reno-Cannon International Airport in Reno, Nevada. A short time later, the aircraft crashed about 1.5 mi (2.4 km) from the end of the runway and burst into flames. It landed near a recreational vehicle dealership, and debris was scattered across US Highway 395 and South Virginia Street. Of the 71 people aboard the lone survivor was then 17-year old George Lamson Jr., who was thrown clear of the aircraft and landed upright, still in his seat, on South Virginia Street. On 30th June 2009 Yemenia flight 626 was en route from Sana’a, Yemen, to Moroni, Comoros. The plane crashed into the ocean, instantly breaking apart as it hit the water off the north coast of Grande Comore, Comoros, in the Indian Ocean several minutes from the airport. 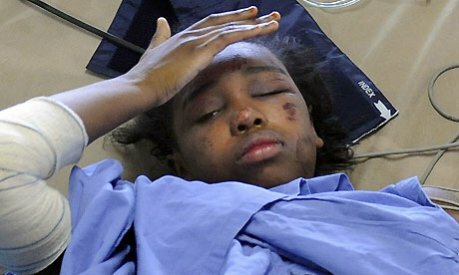 152 people were killed, except Bahia Bakari, who could barely swim and had no life vest, clung to a piece of aircraft wreckage, floating in heavy seas for over nine hours, much of it in pitch darkness, before being rescued. She was traveling with her mother who died in the crash. On 16th August 1987 Northwest Airlines flight 255 crashed after takeoff from Romulus, Michigan with 154 passengers aboard. The plane lifted off the runway at 170 knots (195 mph) and soon began to roll from side to side at a height just under 50 feet above the ground. The MD-82 went into a stall and rolled 40 degrees to the left when it struck a light pole near the end of the runway, severing 18 feet of its left wing and igniting jet fuel stored in the wing. It then rolled 90 degrees to the right, and its right wing tore through the roof of an Avis rental car building. The plane, now uncontrolled, crashed inverted onto Middlebelt Road and hit vehicles just north of the intersection of Wick Rd. The aircraft then broke apart and burst into flames as it hit a railroad overpass and the overpass of eastbound Interstate 94. The lone survivor of the aircraft was four-year-old Cecelia Cichan of Tempe, Arizona. Cecelia’s mother, father and six year old brother all died in the crash. The National Transportation Safety Board determines that the probable cause of the accident was the flight crew’s failure to use the taxi checklist to ensure the flaps and slats were extended for takeoff. 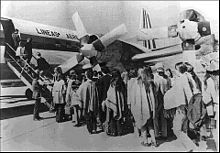 On 24th December 1971 LANSA flight 508 was en route from Lima, Peru to Pucallpa, Peru when at about 21 000ft the plane encountered thunderstorms and severe turbulence. At about 12:36 p.m. local time, a lightning strike ignited the fuel tank in the right wing, which quickly led to structural failure of the aircraft. 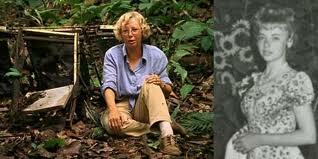 Juliane Koepcke fell to the Amazon rain forest still strapped to her seat. She survived the fall with only a broken collarbone, a gash to her right arm, and her right eye swollen shut. She followed a stream through the dense rainforest, after nine days she came upon a boat moored near a shelter where she waited until some lumbermen came along. They tended to her injuries and bites, then took her on a seven hour canoe trip to the nearest lumber station. On 26th January 1972 a JAT Yugoslav Airlines flight 367 exploded while flying over East Germany en route from Stockholm to Belgrade. 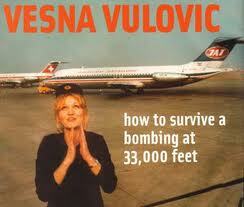 Vesna Vulović, a flight attendant, was near the rear of the aircraft at the time of the explosion. The tail cone of the aircraft was torn away from the main fuselage and both fell from 10,160 meters (33,000 feet) before impact with the ground. 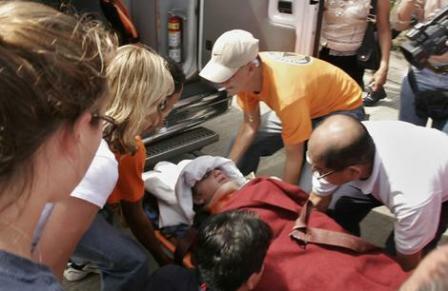 A food cart pinned her to the back of the plane during her fall, acting as a seat belt, thus preventing her from being sucked out of the plane during de-compression or the ensuing fall. Vulović was in a coma for 27 days and was temporarily paralyzed from the waist down, but survived. The official report concluded that the plane had been torn apart from a bomb explosion in the front baggage department. Due to this event she holds the world record, according to the Guinness Book of Records, for surviving the highest fall without a parachute. Thank you for the comment I will be sure to look into this! #8 is not Neil Campbell. I was there that night. The Video camera in the corner didn’t exist for another 20 years.